Newfoundland native Andrew Murley has a medical problem. 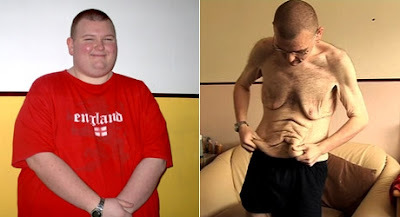 You see Andrew, through lifestyle change, has lost 224lbs, and now he's got folds of hanging skin that are markedly interfering with his quality of life, causing him pain, and putting him at risk for recurrent skin fold infections. Andrew would like his province's Medical Care Plan (MCP) to cover the cost of the $7,000 surgery, but their response to date has been an outright, "No". "I'd like MCP to cover my Botox and liposuction treatments too"
While offering a poll response option that suggests this surgery shouldn't be covered as it might be considered cosmetic may be fair, comparing Andrew's request to Botox or liposuction is making light of a man's suffering, and I would have hoped that would have been beneath the CBC. Now back to the MCP. A man who through his weight loss has saved the health care system far more money than he's seeking, who has a medical need for a procedure, who has a condition that markedly impairs his quality of life - DENIED. And why are his needs being denied? Purely because of blame based or hateful weight bias. Shame on the bureaucrats who've denied Andrew this surgery. Medicine's not about blame, and if there's a medical need, at least on paper here in Canada we're supposed to meet it.